Analytical Graphics, Inc. (AGI), a developer software applications and development tools for timely and cost-effective development and deployment of space, defense and intelligence missions, has released the 10.1 version of Systems Tool Kit (STK), is a physics-based software geometry engine that accurately displays and analyzes land, sea, air, and space assets in real or simulated time. STK 10.1 includes more than 100 new features, including a re-architecture of STK Radar, enhancements to the already powerful Analysis Workbench plus usability improvements (such as "favorites" or "recently used" lists for reports/graphs) and graphics updates that include a new water surface. STK 10.1 Radar updates bring a more intuitive user interface and greater functionality to model and analyze radar systems. Radar is now integrated into the Component Manager, which allows you to pre-configure radar systems and access shared antenna and RF propagation libraries from STK Communications. Radar also now allows for cluttering modeling for a more accurate representation of a radar system. Finally there are three new plugin points for Clutter Map, Clutter Geometry and Radar Cross Section. The updates to Analysis Workbench include the ability to add your own custom calculations via the Custom Script Calculation Component. Time Components can be used in more places to define time intervals (including sensor pointing and model articulations). Finally there are several new components including Fixed Times Time Array Component, Fixed on Central Body VGT Point Component for creating generic LLA points and file type for VGT vector. As for the usability updates, you can now point to the online STK Help to get the most up-to-date documentation. You no longer need to have administrative rights to install UI plugins. Data for more than 50 aircraft has been added to the Standard Object Database. You can also now right-click on graphs to create Analysis Workbench Time Components. Finally we've made some updates to the graphics/visualizations in STK. There is a new water surface that provides realistic ocean surface visualization. The camera inertia update adds faster mouse movements so you can quickly rotate, pan, or zoom to a location before using more precise mouse input. Analytical Graphics, Inc. develops commercial modeling and analysis software for the aerospace, defense, and intelligence communities in the United States, Canada, and internationally. The company supplies software applications and development tools for modeling, engineering, and operations in the areas of space, cyberspace, aircraft, missile defense, C4ISR, and electronic systems. 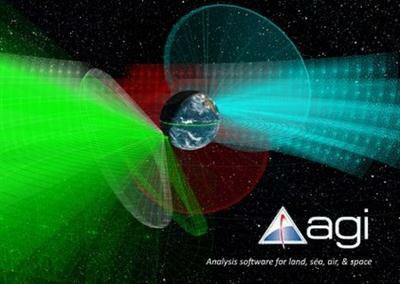 It offers a Systems Tool Kit to model complex systems, such as aircraft, satellites, and ground vehicles, as well as their sensors and communications in the context of the mission environment; software development kits; and an Orbit Determination Tool Kit that provides orbit determination and orbit analysis support for the entire life cycle of satellite tracking systems. PLEASE SUPPORT ME BY CLICK ONE OF MY LINKS IF YOU WANT BUYING OR EXTENDING YOUR ACCOUNT THANK YOU!